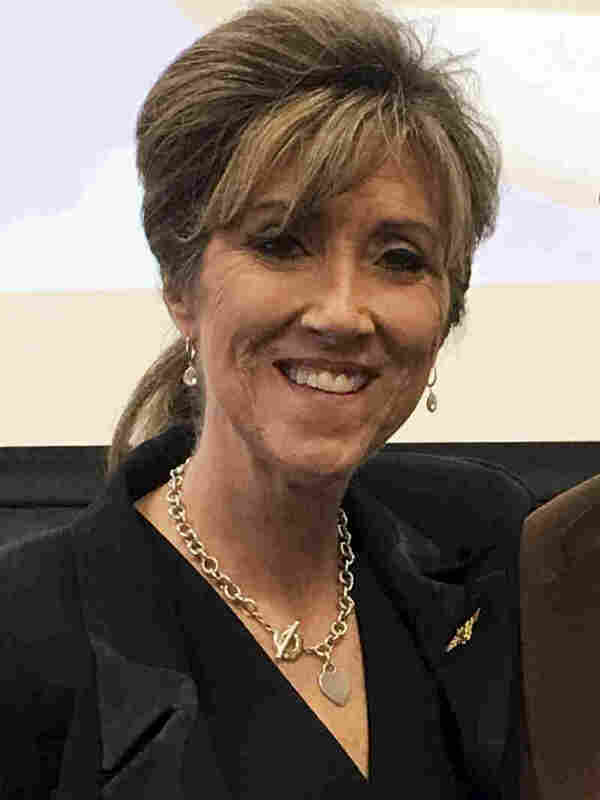 Tammie Jo Shults: Southwest Pilot Is Praised For One-Engine Landing : The Two-Way "We have a part of the aircraft missing, so we're going to need to slow down a bit," the pilot told air traffic controllers as she prepared to land with nearly 150 people onboard. Tammie Jo Shults kept a cool head as she navigated her stricken Southwest airliner to a safe emergency landing on Tuesday. Southwest pilot Tammie Jo Shults is being praised for her cool demeanor after her plane suffered a blown engine — killing one passenger — and she was forced to make a one-engine, emergency landing in Philadelphia with nearly 150 people onboard Tuesday. In the midst of calamity, passengers on Flight 1380 used their phones to send texts to loved ones and share news of their desperate state. "Something is wrong with our plane! It appears we are going down!" passenger Marty Martinez wrote in the caption of a livestream video, showing himself breathing through a mask. In the cockpit of the Boeing 737 en route from New York to Dallas, Shults calmly informed air traffic control about the problems and arranged for emergency crews to meet her plane at its new destination. Here's what happened in midair, in an excerpt of audio recordings from the site LiveATC.net. After Shults landed the plane intact, passenger Diana McBride Self of Corpus Christi, Texas, wrote on Facebook, "A huge thank you to the Southwest Crew & Pilot Tammie Jo Shults for their knowledge and bravery under these circumstances. God bless each one of them." Passengers also said they appreciated what Shults did after pulling off the landing: She walked through the cabin to speak to them and see how they were holding up. "She has nerves of steel. That lady, I applaud her," Self's husband, passenger Alfred Tumlinson, told the AP. "I'm going to send her a Christmas card — I'm going to tell you that — with a gift certificate for getting me on the ground. She was awesome." The scene inside the plane was chaotic: Less than an hour into its planned trip from New York to Dallas, one of the 737's two engines lost a fan blade and its cowling, sending shrapnel into the plane's wing and fuselage — and smashing a window next to where passenger Jennifer Riordan of New Mexico was sitting. With the window gone, the cabin depressurized and yellow oxygen masks automatically fell from their safe positions — and Riordan was partially pulled through the window before her fellow passengers could pull her back in. She did not survive. An investigation into the incident is underway; for now, many are marveling at the way Shults maintained the coolest head during the airliner's plight. A Navy veteran, Shults calmly informed air traffic controllers about the changing conditions of the plane's status. Southwest Flight 1380 made a sharp detour after an engine blew out and depressurized the cabin, as shown in this flight track from the FlightAware site. Audio recordings of the radio communications between Flight 1380 and air traffic controllers detail how Shults coped with a nightmare situation: a forced emergency landing under partial power, and after losing pressure in the cabin. Shults made an initial call to air traffic control, but her next communications were either lost in dense static or consisted only of the plane's alarm systems beeping. Finally, she got through. Shults: "Southwest 1380 has an engine fire. Descending." 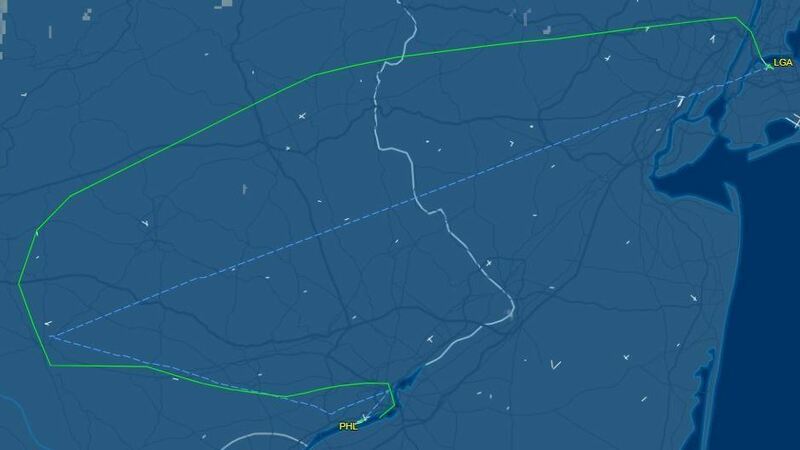 Air traffic control: "South 1380 — you're descending right now?" Shults: "Yes sir, we're single-engine descending, have a fire in No. 1." ATC: "All right, Southwest 1380. OK, where would you like to go to? Which airport?" The closest one, Shults replies, before adding, "Philadelphia." Shults then clarifies that there's no longer a fire but that the engine is lost. After confirming a new heading and a lower altitude, Shults adds, "If you would, have them roll the [emergency] trucks. It's on engine No. 1 — captain's side." Several times in the recordings, Shults ends her communication with one air traffic controller as she passes to another handler by using a standard and courteous signoff: "Good day." Evidently hoping to simplify communications as she and the crew dealt with a dynamic situation, Shults later announces, "We need a single channel. No more channel switching." Shults later speaks to controllers for the Philadelphia airspace, who asked another Southwest flight to maintain a higher speed on its final approach to the runway — so that plane could land before the stricken airliner began its approach behind it. "Southwest 1380, I understand your emergency," an air traffic controller says. "Let me know when you want to go in." "We have a part of the aircraft missing, so we're going to need to slow down a bit," Shults replies, before settling into a lower altitude of 3,000 feet. Shults later asked for medical personnel to meet the plane on the runway to help injured passengers. "Injured passengers OK," the air traffic controller says. "And are you — is your airplane physically on fire?" "No, it's not on fire, but part of it's missing," Shults replies. After a brief period of on-air silence, she adds, "They said there's a hole and ... and, uh, someone went out." That drew a seemingly surprised response from air traffic control: "Um, I'm sorry, you said there was a hole and somebody went out?" But the controller quickly got back on task: "Southwest 1380, doesn't matter — we'll work it out. There, uh — so, the airport's just off to your right. Report it in sight, please." "In sight," Shults responds. "Flight 1380, airport's in sight." The damaged airliner was still able to touch down on its landing gear. As it traveled down the runway, the airport tower told the plane's flight crew members to turn right and stop wherever they could. "Thank you. We're going to stop right here by the fire trucks," Shults says. "Thanks, guys, for the help." Passenger Amanda Bourman wrote on Instagram, "The pilot Tammy Jo was so amazing! She landed us safely in Philly." She also posted an image of the ruined engine as the plane sat on the tarmac. Shults joined the Navy in 1985 and completed flight training in Pensacola, Fla. She rose to the rank of lieutenant commander before leaving the Navy Reserve in 2001. In her Navy career, Shults served in the now-defunct VAQ-34 Tactical Electronic Warfare Squadron in Point Mugu, Calif., as an instructor pilot flying the F/A-18 Hornet and the EA-6B Prowler. Shults was among the first female pilots "to transition to tactical aircraft" such as fighter jets, the Navy says. In the early 1990s, her squadron was highlighted for its "avant garde" approach to integrating women and men into all responsibilities. Both Shults and her husband, Dean, are pilots for Southwest and live in Texas. "She's a formidable woman, as sharp as a tack," Shults' brother-in-law, Gary Shults, told the AP. "My brother says she's the best pilot he knows. She's a very caring, giving person who takes care of lots of people."